Designed for discrete product manufacturers serving the Aerospace, Medical Device, Semiconductor Equipment, Automotive, Precision Optics, Apparel, and Industrial Equipment markets. 1factory Manufacturing Quality Reviews Recently Reviewed! Cons: I honestly cannot say I dislike anything about this software. It has been night and day compared to what I was working prior to 1 factory. Nipun and his team are working towards new additions to the software that we have requested and it seems like the sky is the limit with them. Overall: This software has solved the problem with writing long inspections plans, that are open to human error. Cutting the time to write monthly report which is now done by the click of a mouse. Has helped with task management and driven actions with by dates, which as a QE I love because you are no longer tracking people down for answers. Pros: It's easy to use! Cons: -> As of today, there ARE NO CONS. Overall: We are a medium sized Aerospace manufacturing machine shop and in need of SPC capabilities. The cost and ease of use brought us in, the customer support and added functionality (to OUR needs) has really cemented us with 1 Factory. Although we started with great interest in the SPC functionality, our needs very quickly re-focused to the QUALITY aspects of 1 Factory. The functionality wasn't quite there when we first started but Nipun and his staff are QUICK to implement changes and modify multiple aspects to our specific needs. We're doing things we've NEVER done before because of the ease of use and straightforward interface. We've been able to add so much visibility to our quality functions that we're moving in a positive direction with a lot of purpose, driven by the data; it's great. We have plenty of other improvements to be made to our company and Nipun is there ready to help us achieve them. Recommendations to other buyers: Try it. I find it hard to believe that this wouldn't work wonders for you. Pros: -Organization is made simple by having all of our Quality records in one place. Cons: The 1factory Team has listened to our thoughts, visited many time and took action to help improve and streamline our Quality department in many ways. Any cons have got worked and accommodated to benefit every 1factory user. Overall: The Quality Assurance department is typically a paper-heavy manually driven environment that can be tied to cumbersome tasks such as; filing, storing, and revisiting data at a moment's notice. As a department/company doing our part working towards minimizing paper waste while maintaining or exceeding compliance with customer's standards, being paperless is an important priority. We are ballooning drawings in 1factory, capturing data at each work-center as the parts are being made, and importing data from our CMM. Being able to automatically record hundreds of dimensions electronically via our CMM's is quick; recalling data is fast-and-easy even when searching through a long history of records. Through my experience from a user's stand-point, The 1factory Technical Support is right on par with the actual 1factory product being held at a world-class standard. Recommendations to other buyers: Make the effort to try 1factory and what it has to offer, you will not be disappointed! Pros: The software is easy to use and learn. I have been in the Quality Assurance world for quite some time now and find that both new and seasoned persons would appreciate the simplistic, yet elegant, approach to quality. This software would not only help companies who have never had a CAPA/8D or quality assurance department, it also helps structure and document receiving inspection, supplier CAPA, Internal CAPA. The simplistic way that it produces reporting is a great and useful tool for anyone looking to gain or maintain compliance with regulatory bodies (ISO/AS/IATF) as well as keeping customer satisfaction high with quick reporting/number assisgnments to CAPA/8D reports. Cons: There are no short comings to this software. Anytime I hit any type of bottleneck, I have been able to reach out to 1Factory and an immediate solution is brought forth by the developers. Great response. Overall: The ease of use has allowed our company to quickly scale this sector and provide both Internal and External customers the ability to document from receiving inspection all the way though to production and customer satisfaction. This software is very useful for Quality Assurance implementation, maintenance and documentation. Pros: The IT folks love it: the software is reliably "in the cloud" and has been unavailable for a few minutes out of the 18 months we have used it. The Mechanics like it because of the easy data entry; they can report a nonconformance very quickly and be confident there is a record of their concerns. Task assignments are easy for all users: it is fine as collaboration software. Cons: It still needs some work so that suppliers can work on SCARs within the software. Pros: All of the features in the software have been well designed and the company constantly improves its performance according to the customers requirements and meets more and more international standards. Cons: Most of our request is fulfilled by 1Factory as a regular self improvement and we have call session from time to time with the 1Factory team to coordinate the features we want to improve. so we only have a good experience with the software. Pros: The powerful tools and features to create and capture data for our internal purpose and more importantly our customers. It reduced so much time collecting data and gave us even more results then we had previous. Cons: Every software has it's on quirky functions or bugs and never can you find one that will do everything you want. I see most of the problem is when companies don't know how to evolve or change there procedures to make a tool work. I really don't have an issue enough to list a least liked feature of this software. Overall: Real time data collection, competitive edge, company wide use, accountability to the product we build. Pros: The software is easy to use and learn. Cons: None. The support staff and the 1Factory team have been exceptional partners. Anytime we have found something that doesn't quite seem right or something we think could be done differently the 1Factory team has always accommodated our suggestions. Overall: Overall the experience we have had with 1Factory has been exceptional. There is obvious room for growth as there is with any software but the 1Factory team is constantly making improvements that will benefit all. Overall: This is a Real Time Quality Control Product. It's extremely user friendly and requires minimal training. Inputting data is simple, easy and is conditionally formatted. All quality assurance personal instantly see if a dimension is in or out of tolerance. This alone is a huge time saver when it comes time to review Inspection Data packages and will give your end customer the confidence that data reports are 100% accurate. 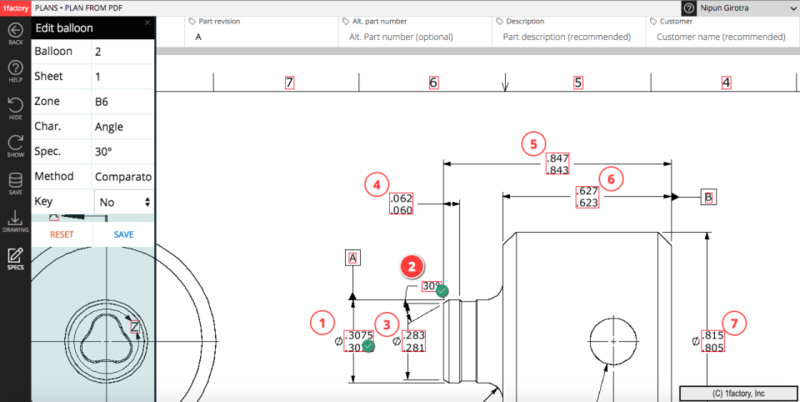 Data is easily imported by CMM reports and by manually inputting the features that the CMM missed. Review of Inspection data now only takes a few minutes to review and sign off. In out old system, the review process could take upto several hours. Also at the same time as you input data, you get real time SPC results of each feature. Tech support at 1Factory is excellent. They respond to all questions and concerns, usually within minutes and typically solve all issues and problems. They do everything in their power to give me everything I ask for down to customized formats to solve my more difficult issues. Pros: Since implementing 1factory on our shop floor we have seen a noticeable improvement with less non-conformance found during Final Inspection. Problems are identified at the machine with corrections being made early in the manufacturing process, thus improving our overall manufacturing flow. Less bottlenecks at Final Inspection with having to 100% inspect a lot before shipping to the customer. Cons: Not to the fault of 1factory, having the ability to directly link with the Ziess Calypso CMM software would further help with our Inspection Department's productivity. Pros: Recently we had a spike in new business with over 60 parts needing First Articles. With the help of 1factory we were able to bubble the drawings, program our CMM to the bubble drawing and directly download the data right onto the First Article form saving lots of time of having to search CMM reports and find the dimension needed. We were able to complete this task of First Articles meeting all deadlines and shipping dates. It was a huge time saver since we are presently understaffed and it made our Quality department shine! Pros: I love 1factory's super clean and user friendly interface. It's totally intuitive and uncluttered. It takes only a few hours to become an intermediate user. The software contains a ton of helpful features and automations. If you're stuck using an old clunky quality software, consider switching to 1factory. Cons: There isn't much to say here. At this point the feature set isn't fully developed but they frequently release new modules and features and these are always included for free with your original access. Overall: 1factory has delivered everything we were looking for and more. We purchased this software as a replacement for our paper receiving inspection system and it's already paying us back. Pros: For us Quality professionals, I think it's fair to say that 'traditionally' we would spend vast amounts of time collecting, compiling and presenting data (all in slightly different formats depending on audience), persuading operators to record measurements, reminding purchasing to find and organise vendor documentation and then compiling all of this information at the last minute for a customer... Well, now there's no need for that, because it's all in here! A one stop shop for nearly everything you would ever need regarding measurement traceability, SPC, Quality Plans, Supplier Management, inspections, the list goes on. Constant updates and communication from the 1factory team and amazing devotion to improving and development make this tool better literally every time you access it. Could not recommend 1factory with any more enthusiasm! Overall: Huge time savings, excellent built in data analysis, all reports can be generated from the data already there. Extremely powerful tool! Cons: Add more report formats and make reports configurable. Read all CMM software. Add gage R & R.
Pros: If you work in Quality Control, this will be the most powerful tool you can use day-to-day. Within days our production floor experienced 40% less non-conformances . As a defense contractor, our customers appreciated the AS9102 format and our inspectors now spend more time actually inspecting now that reports are seamlessly generated. Cons: There is a slight learning curve for this software, but this can be easily overcome even for the most basic user. Just make sure you spend the time reading the tutorials/introduction training - you won't regret it! We welcome user feedback and reviews, but we believe this review is fake. We do not have a record of this customer (The Opl Group), and this user (Jennifer Dado) ever starting a trial or purchasing a subscription to our product. Pros: This makes manufacturing plans for a small machine shop to like even a midsize company easy to create. I have learned quickly just in weeks and after such demos it was so efectivelly. Even made AQL sampling of various dimension easier to set. Before it was more of using excel and doing so much manual but with this system life and work was made easy. Thank you to the support team this is amazing. I will recomendó it to all my friend in QC. Cons: I have not to much all improvements are welcome hopefully some future ahead ERP may be available. Overall: Overall this is an amazing system love it and excited for the new things to come. Comments: Very high quality software to enhance company product quality control, a central cloud based software is always helpful to communicate internally and externally. If you have a question or a special demand, you send a email to the technical support, you can always get response by Webex conference within a few hours, and 99% of your request can be fulfilled within a week. Pros: 1factory is a complete game changer for our quality department. It reduces time spent preparing inspection reports by roughly 66%. Implementation and full integration took 2 hours. If you are not running 1factory your quality department is behind the times. Cons: I do not have any complaints at this time except that I wish 1factory could help us with our manufacturing scheduling. Comments: If I could give customer support more than 5 stars I would have. The 1factory team has been extremely helpful and responsive throughout our interactions from pre-adoption through today. We utilize this software primarily as a measurement data recording and analysis tool. It was easy to implement and the 1factory team helped us with a customized import tool to transition from our old inspection instructions to the 1factory system. The software is fast and efficient for both the admins and the operators. The 1factory team has been very open to suggestions and if they find solutions that apply to all of their customers they have an implementation plan in no time. We have been extremely satisfied with their product and their customer service. Work Life is so much better !! Comments: This software is amazing what it can do !! The efficiency and cost effectiveness alone was a big win for us. For years I have been looking for this kind of software to make our work life a little less redundant in the Incoming Quality Assurance department and this was the one. Not only is the software great, the service they provide, and the quick response to what you need is just top of the line great. This software provides Less paper work, less errors, more quality, monitoring capabilities, spec. requirements, QC Plans, Inspection Plans, Supplier Dash boards, all of this and so much more. And did I mention the money it saved in labor...outstanding !!! Altogether a winning situation. Great Job and Special Thanks to NG, ON, and 1Factory Team !!!! Comments: I have worked in the optics/thin film industry for almost 40 years and I can say with confidence that 1Factory is a superior product. As a Supplier Quality Engineer, I can further attest to the ease of use, efficiency, attention to detail and innovation. All this comes together with 1Factory software to help deliver meaningful results that can help drive higher levels of incoming product quality as well as enable proactive interface with suppliers and provides an excellent platform for internal record keeping as well. There are many advantages to implementing 1Factory, not the least of which is the 1Factory team's excellent customer service. Comments: As I was progressing with our ISO certification, every thing I needed was in 1 factory , If it needed tweeking 1 factory would make it so almost instantly. As we encountered items that we needed 1 factory would come to our business look at the situation, we would discuss what was to be done and usually within 1 week it was live. The customer service is better than expected. This is very powerful and easy to use software. Comments: 1Factory makes my job SO easy! I don't use it all the time but I wish I did. Even in the early stages it was very accessible and whenever I had a question, Nipun got back to me right away. The customer service is outstanding. Highly recommended!! 1Factory has helped us reduce our hands on tact time in more than half. Awesome tool. Comments: We started using in for incoming inspection but it is quickly becoming the go to tool to help manage our supply chain performance.